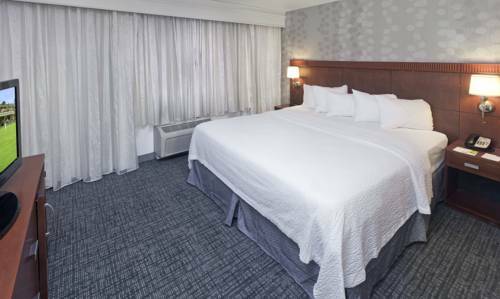 The Courtyard by Marriott Ontario Rancho Cucamonga will meet your unique needs with a spacious, functional, and well-appointed guest room, a Bistro that proudly serves Starbucks, and personal service. Located in the heart of the Inland Empire, and the Rancho Cucamonga business district, we are centrally located to Ontario, Mira Loma, Pomona, Fontana, and Chino. The area is home to several distribution and manufacturing facilities. Experience NASCAR and Indy-Car racing at the Auto Club Speedway, located just 4 miles from the hotel. NHRA Winter Nationals at Pomona Raceway are just minutes from the hotel! World-class shopping and entertainment are just minutes away at Ontario Mills, Victoria Gardens, San Manuel Ampitheather, Citizens Business Bank Arena, Bass Pro Shops, and Quakes Stadium. With meeting and banquet space for up to 50 people, we are the ideal setting for your next event! The Courtyard by Marriott Ontario Rancho Cucamonga welcomes you to our hotel!